Pokémon Origins is a refreshing slightly grittier take on the Pokémon world, that much is true. Its battles are slightly more violent than the main anime series, its character designs and voice acting are more grounded and mature and generally it fulfils my childhood desire to see a more serious anime about an actual Pokémon game. So for all of that I think this is a pretty cool thing. But on the whole Pokémon Origins is more or less just a serviceable slice of fanservice. As far as animation goes it’s fairly average. There are a few battle scenes that have impressive moments but there’s nothing that really pops out. And in between those moments tends to just be not much more than a bare minimum of animation, with characters stiffly moving around a space only when necessary. It gets the job done but not much more, exposing its unique character designs as somewhat basic and uninteresting. As its own original entity from the main anime series it would’ve been satisfying to see it offer something special in the visual department. Its length also doesn’t do it justice. The main Pokémon anime could do with cutting off a lot of fat, but playing out over the course of a significant number of episodes lends itself to the sense of a big adventure that the games they’re based off tend to give. To me this is one of the most important parts of the Pokémon world, the feeling it’s a vast world of people living and battling with extraordinary creatures in all sorts of different ways. 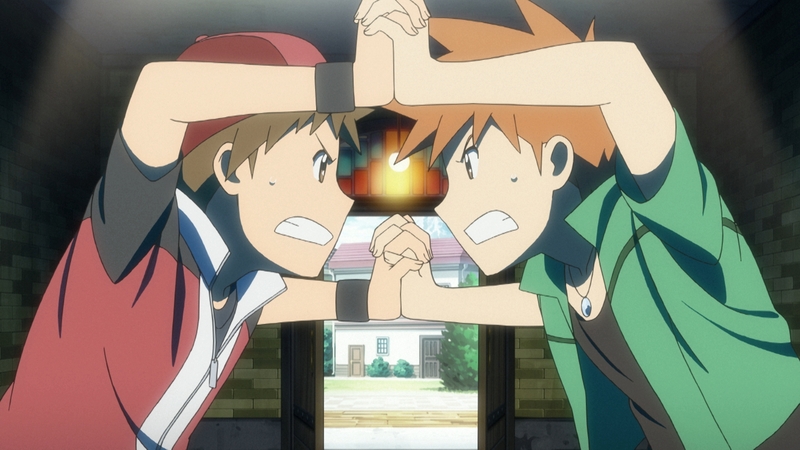 With only four twenty minute episodes this is sorely lacking from Pokémon Origins. The majority of the gym battles go by in quick vignettes, with its only interesting being in the biggest most interesting moments of the original games. It’s enjoyable to see these moments play out in animation, but even as a nostalgia trip this is a pretty thin experience of the games. I also didn’t like its lack of humour. The earlier seasons of the Pokémon anime were endearing in large part because of how goofy and upbeat many of its recurring characters were, and a lot of that shaped what I got out of the games and their personality. Pokémon Origins opts to be straight and mature in targeting the older audience who grew up on the games, and in doing that it loses a lot of the fun. When I envision Blue in the original games I tend to get the smug nasally stylings of Jimmy Zoppi in my head, and suffice to say that hasn’t been changed. I like the idea of distancing from the cheesiness of the main series, but there just isn’t enough interesting going on with this direction to make it stand out over its long-running counterpart. Maybe as a Johtoddler from the Hoennbaby generation I just can’t fully appreciate this tribute to the games that started it all. But in any case I feel Pokemon Origins doesn’t really excite. It takes a new approach and it covers the big story events well enough, but it can hardly be said to transcend its nostalgic value. If you’re a fan of the series or at least the original games it’s a nice way to reminisce. But if you just want to relive the games you would be better off just reliving the games. A nice addition to the franchise, but not necessary viewing.